Iranians like to boast that they come from a land of poetry and art. It isn't surprising, then, that socio-political movements in Iranian history are often accompanied by efflorescence in arts. 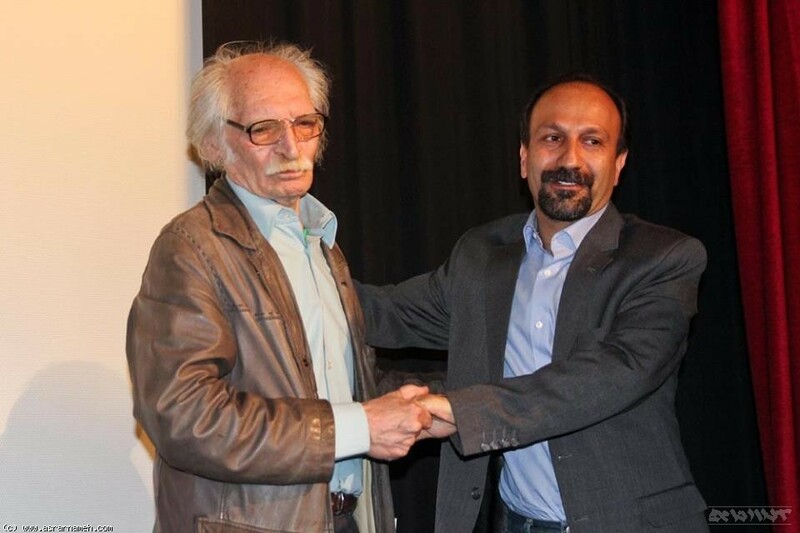 Asghar Farhadi and Mahmoud Dowlatabadi take a picture together at a celebration of the Director's Guild of the House of Theatre from 2011. Photo from Asrarnameh with intention to republish. The recent protests that first broke out on 28 December and spread throughout the country are no exception. Participants in the demonstrations made demands for better economic opportunities, spurred on by the release of the national budget for the upcoming year. A total of 25 people died and nearly 4,000 were arrested in the unrest, according to the Iranian judiciary, though hundreds have been released, including 500 in Tehran. The wave of largely spontaneous protests received a measure of artistic accompaniment (although perhaps less when compared with more coordinated movements of the past). A few well-known Iranian artists abroad recorded a cover of a Persian rock favorite, “Shayad,” to show their solidarity. Numerous actors, writers and musicians, in Iran and abroad, have also declared solidarity by signing petitions or tweeting their support. But here I want to write about the reactions of two towering figures of Iranian literature and cinema: Mahmood Dowlatabadi and Asghar Farhadi. One simply criticized the burning of the flag, even as his poetry was shared online as commentary on what was at stake in the protests. The other offered support for those fighting for a better Iran. Mahmood Dowlatabadi is arguably the greatest living novelist writing in the Persian language. 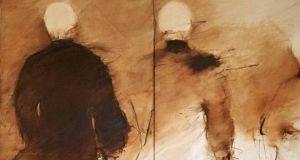 Dowlatbadi is often derided by his colleagues for his conservative attitudes and for having left the Association of Iranian Writers (AIW), which is more steadfast in its opposition to the undemocratic practices of the Islamic Republic. This is sometimes unfair as Dowlatabadi is a victim of censorship himself and does occasionally raise a voice in protest. Last month, in the final ceremony of a literary award named after novelist Ahmad Mahmood, Dowlatabadi reminded the audience that some of Mahmood’s novels are not allowed publication while the authorities don’t stop the circulation of their pirated versions. “You are hostile to some writers. This hostility is totally individual and on your part,” Dowlatabadi said. “You have become cultural authorities and you ban the works of Ahmad Mahmood. Go and see in what conditions the writer of ‘My Uncle Napoleon’ lives. Have you ever asked yourself who publishes his books?” referring to Paris-based Iraj Pezeshkzad, who would be a millionaire if he received royalties for the tens of thousands of pirated copies of his novel that remains banned in Iran. Dowlatabadi caused controversy when, on the sidelines of a conference on his works in Tehran, he limited his remarks on the protests to condemning the burning of the Iranian flag, which was done by fringe elements in the protests. Some argued it felt as if he was siding with the authorities. I have heard people have pulled our flag down. I have really felt this insult. I condemn this ugly act. It is not understandable at all. with their own eyes of belief? Oh my mother, oh Iran! Filmmaker Asghar Farhadi is one of the best-known Iranians around the world. He has won two Oscars, and the best film festivals in the world fight over showing his films. He is currently in Spain shooting a large-scale Spanish-language production, “Everybody Knows” (“Todos lo saben”) staring Javier Bardem, Penelope Cruz and Inma Cuesta. Farhadi wrote a note in support of the Iranian protests and said that people were right to question the status quo. His note was shared in many Iranian media outlets, included Iran Newspaper, which is affiliated with the government of Hassan Rouhani (seen below) and in another news outlet, the semi-official Iranian Labour News Agency (ILNA). #Asghar_farhadi's reaction to the recent protests: Alongside all these demands, the unanswered questions that have been overlooked and ignored in all areas over the course of these decades, left unanswered and given unrealistic and delusional responses. “In these years, what has driven part of our people to protest are the unanswered questions which have been ignored for decades or have been given unreal and illusionary answers,” Farhadi wrote. The filmmaker also expressed solidarity with those who had lost their loves ones in the protests and especially the relatives of Armin Sadeghi, the 15-year-old boy who came from Farhadi’s own city of Khomeinishahr in Isfahan province. Armin’s “eyes, filled with longing for life,” were in Farhadi’s thoughts every day, he said. He had been killed in armed clashes in Khomeinishahr, the city in which Farhadi was born in 1972. In their own ways, Dowlatabadi and Farhadi relate to the protests, and their works are vehicles through which Iranians continue to understand their lives and times.